LEAD CUFF stabilizer is a PVC coated pliable lead strip that can be opened and closed to fit straight-sided plastic labware. 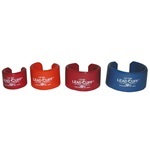 LEAD CUFF will prevent lightweight labware such as plastic bottles, filtering flasks, and other apparatus from tipping. Keeps your labware upright and protects against dangerous spills.